At the town hall meeting, Jim tries to take over again and his first agenda is to find Melanie. Barbie decides to attack Big Jim – I approve. But, alas, Christine and Eva arrives to stop the murdering. Damn it, Eva. Christine spins her story of them both being hiking and entering the cocoons 3 weeks ago – she also keeps her cover story from the Dometrix: she’s a therapist. Julia still hates Big Jim, the one good decision she’s made. Instead, Sam goes and finds James and stops him committing suicide. Damn it, Dome, stop teasing me! Sam decides to throw a whole lot of AA Rock Bottom philosophy at him and drags him to the support group which he leads to help people. James leaves and runs into Christine who gives more advice – which seems to be “kill Jim and burn your house down” I approve. So what’s the next important topic? Barbie was with Eva and Julia isn’t happy… yeah Barbie in a shocking moment of being sensible, tells Julia they’ve actually got more important things to deal with. They go into the tunnels where Melanie has disappeared; Barbie is still having trouble accepting that Melanie is evil and Julia refuses to not talk about Barbie’s cocoon relationship with Eva. They split up and Barbie finds Ben’ body where he was killed after his Marginalised Swan Song. He hurries in a panic to save Julia – to prevent Melanie from killing Julia. Barbie now believes that Melanie is evil – because a bruised neck counts way more than Julia’s testimony. He can now talk about Eva to Julia – including how he fell in love and how they were together, yesterday while Julia was mourned months ago. and Melanie fight (personally I would have backed Julia in that fight but her leg goes from 100% perfect to collapsing every 5 seconds). Melanie may also have super strength. She starts strangling Julia but Christine arrives and stabs her. Damn it Dom, you teased Julia’s death twice in 2 episodes. STOP! Barbie crawls out of the bit and Christine fakes being upset about stabbing someone. As Barbie points out after they bury the bodies, now they’ll never know the answers from Melanie. Norrie, Joe and Hunter keep love triangling and Norrie has a good scene of grief where she misses the life she had in the cocoon – which Hunter takes as chance for more flirting. And Joe being more mopey and actually has a point about how Norrie and Joe just moved a body to get at the goods and party is all kinds of disrespectful. Joe also fails at gathering food – freeing the pig he managed to catch in his snare only to watch Norrie shoot it and be all sad panda about it. Big Jim decides to load up a boat and head to the island – he tells Julia that everyone who was cocooned has been changed. I think he’s right. I also think he’s right – which is a terrible terrible thing to have to feel. Julia, of course, disagrees – because she’s never right. Jim is also joined by his stalky dog. That night, Christine uses her purple rock to summon the entire town who attend like weird zombie people though she notes others need more work and others needs to be killed. Notably Eva is also one of the pod people. This entire season is just going to be one long tease isn’t it? I’m constantly going to see characters I loathe (that would be almost all of them) almost die but then juuuust pull back. Do you know what makes the terrible, random, ill-thought our and generally awful plot of Under the Dome even worse? LOVE TRIANGLES! Love triangles everywhere! Please spare me. 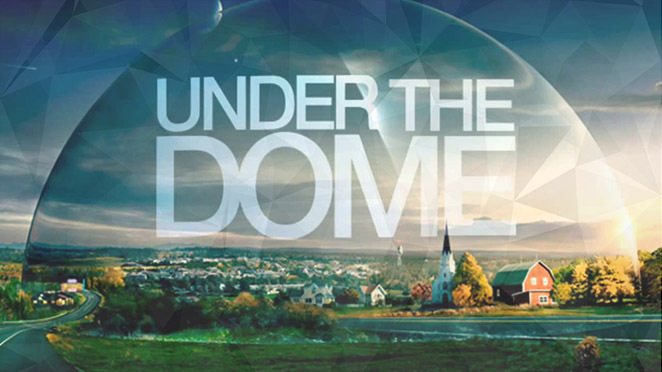 Olympus and Under the Dome. I want a damn medal.